Let’s get this out of the way from the start: I’m no woodpile master. My ancestors weren’t lumberjacks back in the old country, nor have my kinfolk been stacking firewood in the Green Mountains since Ethan Allen first learned to wield an ax. Indeed, YouTube is rife with videos of hirsute men in hunter plaid espousing their regional preferences for what constitutes a proper woodpile. Several even suggest that you can judge your neighbors’ characters by how well they stack their firewood. Personally, I judge my neighbors’ characters by their willingness to clean up their dog’s poop, and their occasional texts saying my kids are eating dinner at their house. That their woodpile happens to have the structural integrity of a suspension bridge just reminds me that they’re both architects. Two tarps: one as ground cover (optional) and the other to keep snow off the stack. When I looked upon mine from last year, it was with bemusement and mild embarrassment. 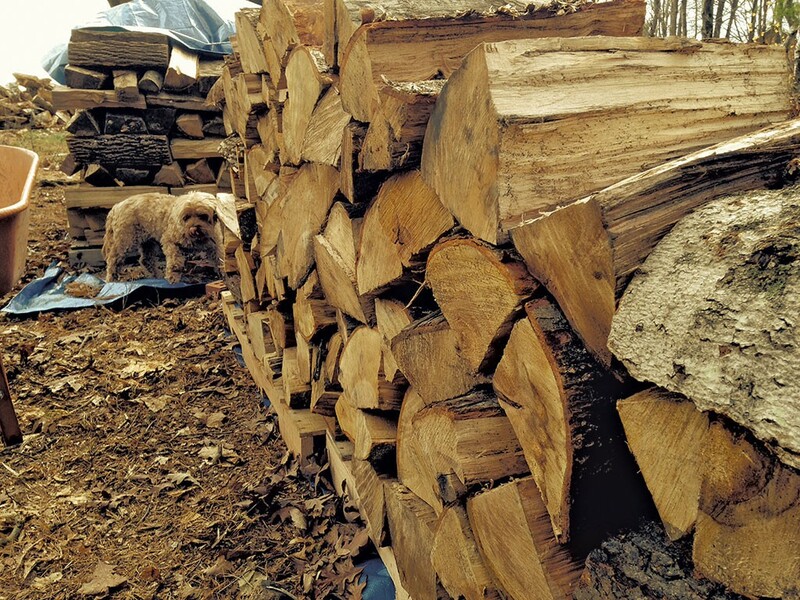 So I did some homework and boned up on how to construct a sturdy New England woodpile. When all’s said and done, a woodpile needs to perform several basic functions. First, it should allow newly cut wood to season, preferably for at least a year. Burning green firewood isn’t just inefficient and wasteful; it can also lead to dangerous levels of creosote buildup in your chimney and cause a house fire. Second, a woodpile should keep your firewood neat, easy to access, off the ground, and away from water, mold, fungus and insects. It’s best to determine where you intend to build your woodpile before the wood is delivered. It should be stacked far enough from the house and garage so as not to invite snakes, rodents, termites and other critters to take up residence in your own dwelling. But it shouldn’t be so far away that you would have to post-hole through 100 yards of waist-deep snow to reach it. Popular lore suggests siting your woodpile in maximum sun, much like a vegetable garden, to help the firewood cure. Choose a level, dry area where water doesn’t pool. In my case, I mowed a 12-by-14-foot area of scrub brush behind last year’s woodpile and covered it with a ground tarp to keep the poison ivy from sprouting through the wood in the spring. Next, lay out your wooden pallets either end-to-end or in a U shape. Ideally, your woodpile should allow air to circulate around and through it in order to speed the seasoning process. Begin at one end by stacking logs into cribbing — rows of three logs each, stacked perpendicular to each other — and building upward. Once a cribbed end is at least four feet high — a standard cord of wood measures 4 feet by 4 feet by 8 feet — begin stacking the logs horizontally. About eight feet from the first cribbing, begin a second crib and build upward. If the cribbing is built properly, each should stand on its own without leaning. Fill in the wood between the cribs accordingly. Avoid stacking logs too tightly, and leave plenty of room for air to circulate. Also, it’s best not to stack a woodpile taller than five feet. Otherwise, if it becomes unstable as the wood is withdrawn, it could fall on you. Besides, a towering woodpile makes it difficult to remove the snow that will inevitably accumulate on top. 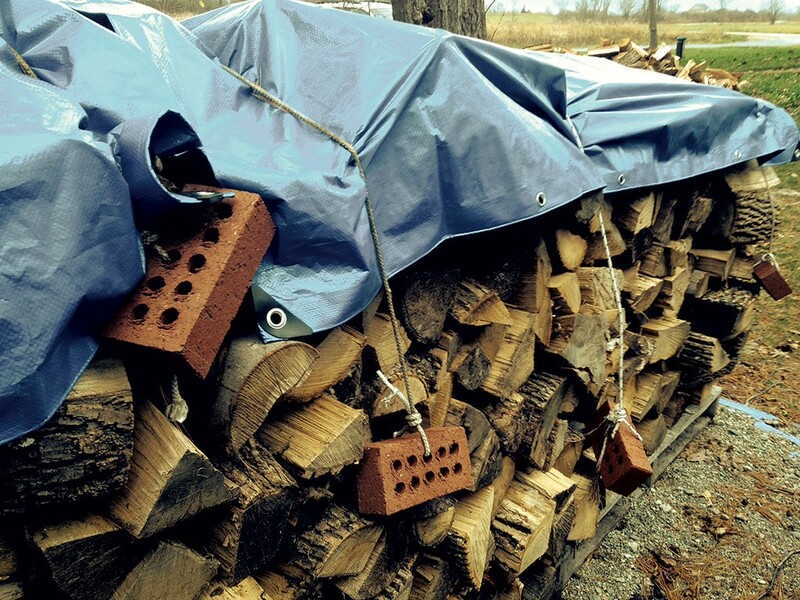 When the woodpile is finished, drape a tarp over it, leaving the sides open to the elements. 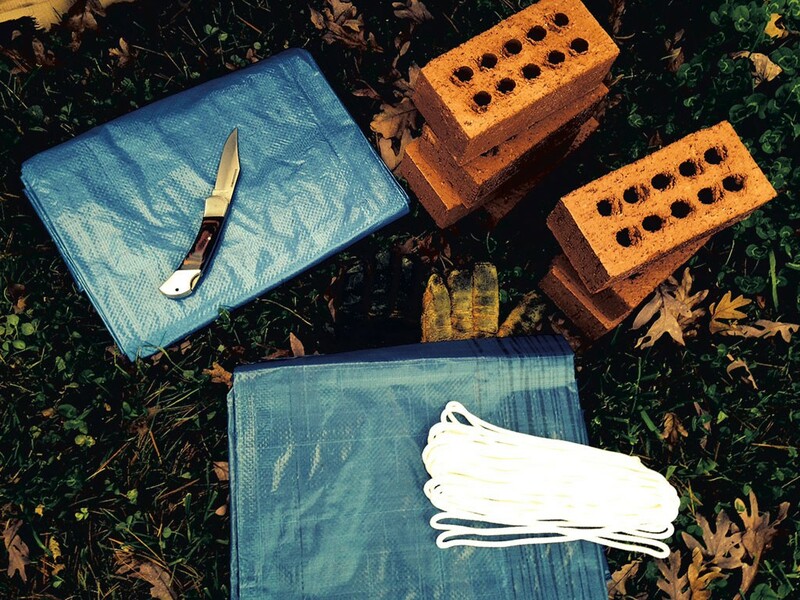 Next, cut four lengths of rope, drape them across the tarp and tie each end to a brick to hold the tarp down in the wind. One local logger suggests cutting the rope segments short enough to allow the bricks to dangle from each side. That way, as the woodpile dwindles throughout the winter, there’s no need to retie the tarp down. Admittedly, my latest woodpile will win no awards for aesthetic beauty, nor will Architectural Digest be sending a photographer over anytime soon. Still, the chipmunks seem to be enjoying it already, and we’re set for home heating through the winter of 2017. The original print version of this article was headlined "Stacking Up"